A bold, idea-based book on revitalizing art in schools at a time when budgets are being slashed. Artist Mark Cooper aims to change the way you think about making art with kids. Working with schools around the country, Cooper has brought together scores of teachers and hundreds of children to make remarkable collaborative art that has enlivened classrooms and public spaces and been displayed in the nation’s most prestigious museums. In this inspiring, practical, idea-filled book, Cooper shows how any teacher—not just art teachers—can imagine and execute similar projects in their own classrooms. But more than that, Cooper transforms our sense of possibilities, arguing for a new view of art in schools. 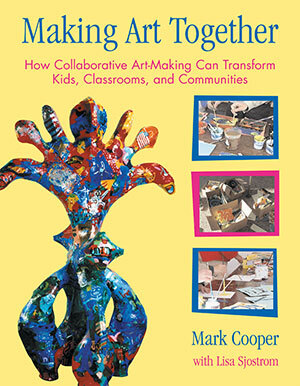 Making Art Together is a book about art education structured around big ideas: that adults can flourish in the role of Master Artist, that the perspective of contemporary art offers liberating possibilities for rethinking art in schools, that art can and should be about the larger world, and thus naturally ties in to all areas of the curriculum. Most of all, Cooper shows us the power of collaboration. From mammoth, freestanding sculptures to billboards against violence to maps of the world, the projects here are all planned, designed, and completed by children themselves. The resulting artwork is complex and ambitious on a scale that would be out of reach for any individual child. Working collaboratively, using a distinctly democratic model, kids actually think and work like adult artists throughout every stage of the project. Together the sky’s the limit-the artistic and educational opportunities are boundless. Making Art Together is a bold, beautifully illustrated book that could—at a time when art budgets are being slashed—revitalize our sense of what art in schools can accomplish.